Horseradish peroxidase conjugated Goat anti Mouse IgG antibody used for the detection of murine IgG by ELISA. PRO 2000 co-application induces increased mucosal antibody responses in mice. 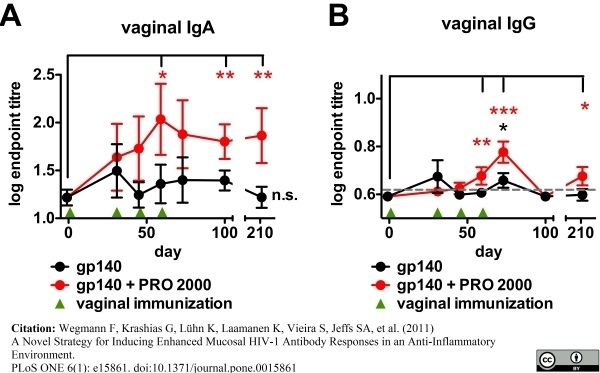 BALB/c mice (n = 7) were immunized four times vaginally with 12.5 µg gp140 +/− 1% PRO 2000; Time courses of the vaginal lavage IgA (A) and IgG (B) endpoint titres. gp140 + PRO indicates combined gp140 and PRO 2000. Titre data were log-transformed and are shown as mean ± SEM. The grey dashed line indicates the ELISA detection limit. * p<0.05; ** p<0.01. From: Wegmann F, Krashias G, Lühn K, Laamanen K, Vieira S, Jeffs SA, et al. (2011) A Novel Strategy for Inducing Enhanced Mucosal HIV-1 Antibody Responses in an Anti-Inflammatory Environment.PLoS ONE 6(1): e15861. Second-site immunization in the presence of PRO 2000 increases systemic and mucosal antibody responses. BALB/c mice (n = 7) were primed intranasally with 10 μg gp140 per animal in polycation and were boosted three times vaginally with gp140 +/− PRO 2000. Samples were collected 14 days after the final vaginal immunization. Serum IgG endpoint titres (A), or vaginal lavage IgG (B) and IgA (C) endpoint titres normalized to the total IgG or IgA content or each sample, respectively, are displayed. gp140 + PRO, combination of gp140 and PRO 2000. * p<0.05. A Mouse monoclonal antibody of the IgG1 isotype was run under reducing conditions on SDS PAGE using the Bio-Rad V3 Western Workflow™ and transferred to a PVDF membrane. Precision Plus Protein™ Prestained Standards were run in lane 1. Goat anti mouse IgG (Fc) polyclonal antibody reacts with mouse IgG at an epitope localised to the Fc region as assessed by immunoelectrophoresis and ELISA. Cross reactivity with IgA and IgM is negligible. 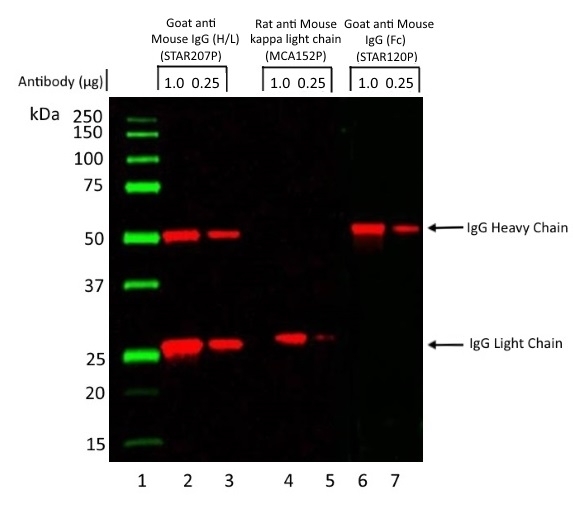 Goat anti mouse IgG (Fc) polyclonal antibody may cross react with IgG from other species. Antisera to mouse IgG were raised by repeated immunisations of goats with highly purified antigen. Purified IgG was prepared from whole serum by affinity chromatography. 12 months from date of despatch. Where this product has not been tested for use in a particular technique this does not necessarily exclude its use in such procedures. Suggested working dilutions are given as a guide only. It is recommended that the user titrates the antibody for use in their own system using appropriate negative/positive controls. Use 50ul of the suggested working dilution to label 106 cells in 100ul. Nejsum, P. et al. (2009) Population dynamics of Trichuris suis in trickle-infected pigs. Yuan, T. et al. (2010) Chondrogenic differentiation and immunological properties of mesenchymal stem cells in collagen type I hydrogel. Biotechnol Prog. 26 (6): 1749-58. Wegmann F et al. (2015) The carbomer-lecithin adjuvant Adjuplex™ has potent immune activating properties and elicits protective adaptive immunity against influenza challenge in mice. Clin Vaccine Immunol. pii: CVI.00736-14. Swaffer, M.P. et al. (2016) CDK Substrate Phosphorylation and Ordering the Cell Cycle. Trindade, A.B. et al. (2017) Mesenchymal-like stem cells in canine ovary show high differentiation potential. Cell Prolif. 50 (6)Oct 08 [Epub ahead of print].